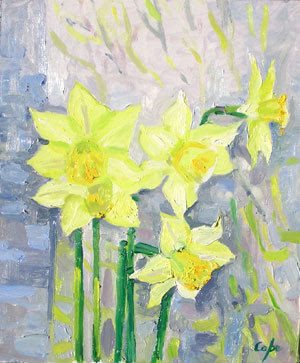 I’ve been watching these daffs from over the top of the computer, outside my studio window, & frequently wondering just when I can finally get outside (& play – not unlike how I felt at school too). This year, I didn’t miss to do so. Vernal equinox, green fuse. BTW, the daff is Narcissus ‘Binkie’. 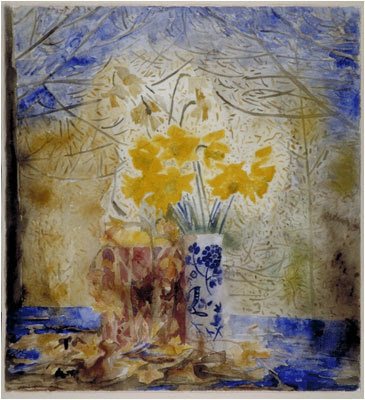 Whilst tracing genealogies, I’m happy to mention my painting tutor at Newcastle University Art School, Norman Adams( ex Keeper of the Royal Academy Schools), who loved daffs too. He was a great English artist. Here’s one of his watercolours.